Sometimes I feel a bit like Frances, eating bread and jam as much and as often as I do. Breakfast is always two oblong pains au lait, brioche buns, smeared with cherry jam. Every single day. While there is often cake on the kitchen counter and cookies galore in the pantry, when snack time rolls around (mid-morning, mid-afternoon, just before a workout), I find the jam and grab either the loaf of bread or baguette, the box of biscottes, or a slice of matzoh, heat up a café au lait and go to town. When out of town staying in a hotel, the basket of croissants and chunks of baguette are placed between us, and don’t we all feel that a croissant is the most luxurious breakfast treat? Well, I offer my croissant to husband, split the hunk of baguette in two, spread it with jelly or jam (cherry, orange) and start my day with bread and jam. And, of course, now I am making jam by the ton every year, all year long for the hotel. I am swimming in jam! Oddly enough, I didn’t quite take to it like a fish to water, but although I was nervous about taking on this weighty task, I have produced enough jams intrepidly to keep the hotel jam cupboard well stocked and the breakfast tables laden with a large selection of flavors. By this, our third year at the hotel, something clicked and I now feel so comfortable making jam that I do believe I could do it in my sleep. As I recently noted in my recent blog post about Pear Jam Tart, my favorite part of making my own jams is playing with the flavors. Spices or fresh herbs, liqueurs, and unusual combinations of fruits and even vegetables make what could be a chore actually pretty exciting and most definitely fun. So I have whatever flavor I crave at my fingertips, from Wild Plums with Cardamom, to Fig, Raspberry, Strawberry with Porto, from mixed Citrus to Greengage Plum with Allspice and Pumpkin with Persimmons and Orange. And as I begin the outline of my next cookbook project all about jam, I understand that jams are also perfect for cooking and baking, stirring into sauces and glazes, filling tarts and cake rolls, folding into whipped cream and frostings. This is such a festive treat, somewhere between a bread and a cake, just where a brioche aught to be. While fairly time consuming like any yeast preparation, it’s pretty simple to make and certainly impresses! You could even dress it up in icing glaze, sugared cranberries, and sparkling sugar pearls and present it as a Christmas wreath. 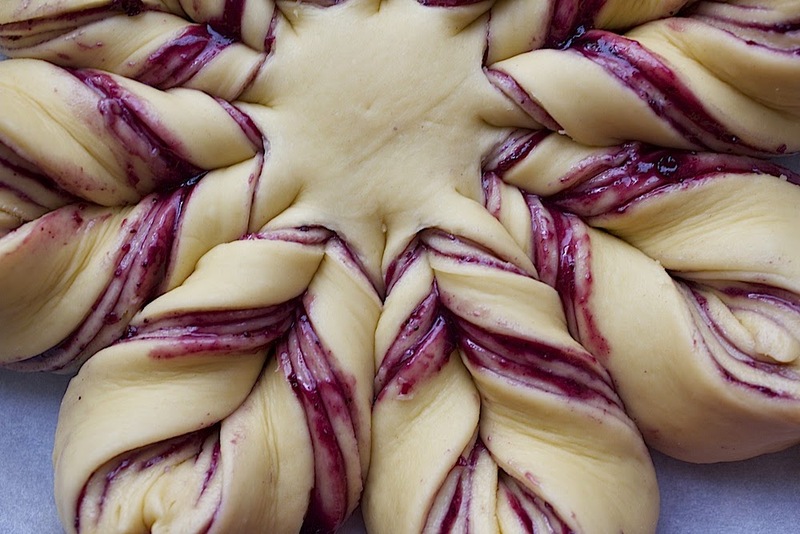 Jam is the perfect filling for this Brioche Flower although many use Nutella or another chocolate hazelnut spread. I will be making another, spreading the layer with my traditional galette des rois rum frangipane filling and drizzling the orange icing glaze from Orange Appeal all over the top. I originally made this spectacular Brioche Flower for a 2014 Bread Baking Babes challenge using a recipe from Cathy of the blog Bread Experience, a blog and a wealth of information and recipes about all things bread. Cathy suggested we watch this excellent video on The Bread Kitchen for visual instructions on shaping the flower. 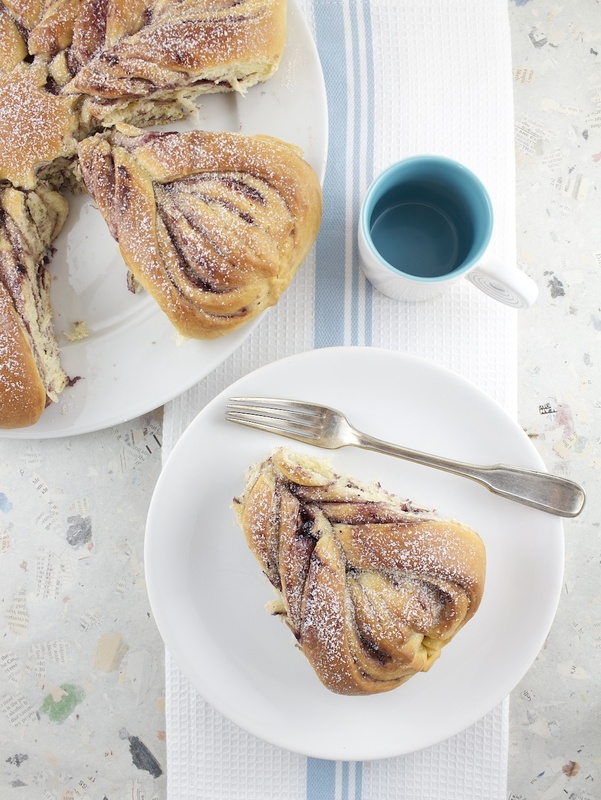 A special, festive brioche layered with your favorite sweet filling, either jam, Nutella, or frangipane. Make it your go-to family treat for the holidays, serving it with mugs of coffee and glasses of cold milk while opening presents on Christmas morning. Stir together the flour and yeast in a large bowl or the bowl of your stand mixer. Pour in the warm milk and whisk the ingredients together until all of the flour is evenly wet. Cover with plastic wrap and let it activate and ferment for 30 - 45 minutes, or until the sponge rises and falls when you tap the bowl. Add the eggs to the sponge and whisk (or beat on medium speed with the paddle attachment) until smooth. In a separate bowl, stir together the flour, sugar, and salt. Add this mixture to the sponge and eggs and stir (or continue mixing with the paddle on low speed for about 2 minutes) until all of the ingredients are thoroughly incorporated. Let the dough rest for 5 minutes. Blend in the melted butter by hand, using a wooden spoon (or with the mixer on medium speed using the dough hook). Add in a couple of teaspoons of milk if the dough is too dry. (my note: the dough was too dry when I added the dry ingredients so I went ahead and added the warm, melted butter immediately, stirred until blended and smooth and then let it rest for 5 minutes). Transfer the dough to the work surface and knead for about 8 - 10 minutes until the dough is soft and smooth. It shouldn't be too sticky too handle. Form the dough into a ball and place it in a clean bowl (it doesn't need to be oiled; the butter should keep the dough from sticking to the bowl), covering the bowl with plastic wrap and a clean kitchen towel. Let the dough rise in a warm place for 1-2 hours, or until doubled in size. Meanwhile, cut out a circle of baking or greaseproof paper about 12 inches (30 cm) in diameter. Place the paper on a baking sheet. Once the dough is risen, turn it out onto your work surface, punch it down and knead for 3 - 4 minutes. Divide the dough into 4 even pieces and form each piece into a ball. Working one ball of dough, roll the dough out into a circle measuring about 10 inches (25 cm) in diameter. The dough should be thin, about ⅛-inch (3-4 mm) thick. Place this first circle of dough onto the baking paper (gently reshape or roll back into shape and size just as needed) and spread on a layer of Nutella, jam or filling, leaving a small space (1/2 inch/1 cm) bare around the edge. Don’t make the layer too thick but be sure to evenly cover the dough. 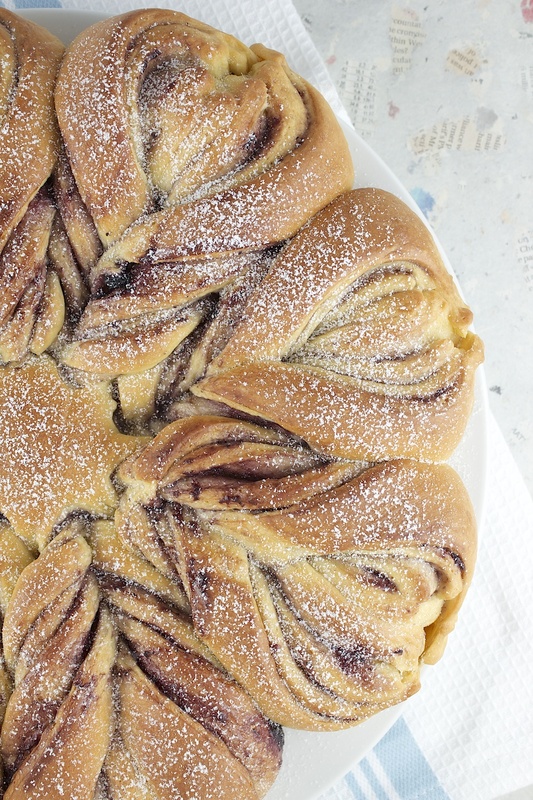 Roll out a second ball of dough, place it on the first layer, gently evening and stretching it into place and spread with another layer of Nutella, jam, or filling. Repeat with the third and fourth balls of dough but do NOT spread Nutella, jam or filling on the final, top layer. Watch the recommended video in the notes for visual instructions on shaping the flower. Mark a small (1½-inch/3 cm) round in the centre of the dough which will remain uncut: : I used a 3 cm round biscuit cutter and gently pressed in the center to leave the barest of indentations which helped me stop cutting at the same distance from the outer edge to the center, evenly all the way around. Cut the brioche "sandwich" through into 16 even segments leaving this round in the centre of the dough uncut. Take a pair of adjacent segments. Lift and twist them away from each other through 180°. Lift and twist through 180° again, then twist through 90° so that the ends are vertical (see the video). Press the edges together firmly. Repeat this process for all pairs of segments. You'll end up with 8 "petals". Cover the brioche lightly with oiled plastic film or wrap. Leave in a warm place to prove/rise for 1 - 2 hours. Preheat the oven to 360 degrees F (180 degrees C) for a conventional oven or 320 degrees F (160 degrees C) with the fan. Once the brioche has risen, remove the plastic wrap and once again firmly press each point (folding each point over onto itself) to seal well. Make the wash by blending the milk and water together then delicately brushing the dough all over. Bake the Brioche Flower for 20 – 25 minutes (my note: I baked mine for closer to 30 minutes at 360 degrees F (180 degrees C) until risen and the areas of the bread brushed with the milk wash are a deep golden brown. Remove from the oven and place the bread on a wire rack to cool. Once cooled, dust lightly with icing sugar and serve. I highly recommend watching this excellent video on The Bread Kitchen for visual instructions on shaping the flower. I always enjoy it when you write about jam. You obviously love the stuff! And make me want to slather some bread with jam, too. 🙂 Fun read — thanks. Happy Holidays!